The Arc’teryx Procline is designed for the new generation of female alpinists that prefer to bring their skis. With a revolutionary split cuff design, the Procline is a ski boot that climbs like no other. With a rigid Grilamid & carbon fiber shell, the Procline is a mountaineering boot that skis like no other. If you’re looking to be like no other woman in the mountains, the Procline boot is made for you. It is designed to meet the needs of alpinists and skiers, combining approach comfort with downhill chops. The Procline has the agility to get up difficult routes and the security to get down. All-around it protects from the elements with an integrated, rugged gaiter. 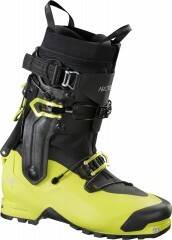 This is a no-compromise ski mountaineering boot from Arc’teryx. Innovative split cuff offers 35° of lateral articulation coupled with 75° front-to-back. CORDURA® gaiter offers resistance to puncture and abrasion with TPU reinforcements. Machined 6060 aluminum lower buckle cradles your lower foot and won’t open accidently. Cam lock power strap micro-adjusts easily and provides pressure distribution and smooth flex. Gaiter with rugged zip is integrated with the shell for complete protection from snow. Hybrid Closure System makes for fast transitions and reliable hold skiing and climbing. Rugged Vibram® sole has a tread designed for smearing, heel braking, and edge control. Lightweight Grilamid® shell offers good durability and power transfer to the ski. Toe is coated with rubber to provide durability and extra friction for odd rock moves. Comes with either a flexible Lite liner or a Support liner for warmth and ski performance. The preorder for the Arc’teryx Procline boots says fall 2017. Do we know when this product will be available again? Hey Hayley, thanks for reaching out. Sorry for the slow reply! Unfortunately due to the recall we're unable to even give an educated guess as to when they'll show up. What is 11 + 4?